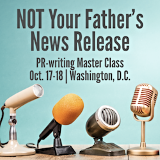 Would you like to learn to write copy that moves people to act? Master a structure that’s proven in the lab to work better than the inverted pyramid? Make every piece you write measurably easier to read and understand? If so, please join me at Catch Your Readers, a two-day writer’s Master Class on April 21-22 in Chicago. Win with your pen Your job isn’t to press Send. It’s to get people to 1) pay attention to your message, 2) understand it, 3) remember it and 4) act on it. Learn techniques for achieving those goals at our Chicago Master Class. Fill your toolbox with tricks. Browse all 2015 Master Classes. I love you, Portland, but I’ve got to say, I think Chicago is the most beautiful city in the United States. You’ve got the history of 20th century architecture reflected in a glittering river. You’ve got buildings by two of my favorite Franks, Mssrs. Lloyd Wright and Gehry. And then there’s that magnificent ‘bean’! Why not make a long weekend of it? I, for one, will be winding down from the workshop by taking an architectural riverboat cruise, spending my retirement savings on The Magnificent Mile, catching the latest shows at Steppenwolf and Second City, eating whatever Rick Bayless sets in front of me at Topolobampo and ogling the Impressionists at “the best art museum in the world” (TripIt), the Chicago Art Institute. Maybe we’ll run into each other! I have no doubt that this Master Class will be the best money you invest on your professional development this year. Plus, you can save money and earn more bonuses when you bring a friend, refer a friend or belong to RevUpReadership.com. Interested? Contact me directly, learn more or register now.